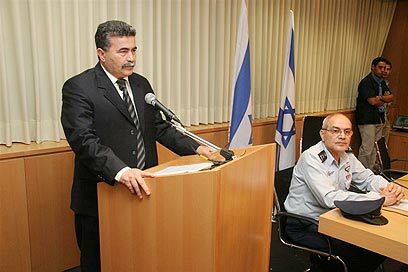 Defense Minister Amir Peretz said Thursday evening during a special press briefing in Tel Aviv that "as a man of peace, I say that we have embarked on an unavoidable war. This is a war we must win." He added that the enlistment of reserve soldiers approved by the cabinet was aimed at "preparing for any possible development. If needed, we will exert all the power required in order to defend Israel and complete the battle. We are preparing for an order." IDF Chief of Staff Lieutenant-General Dan Halutz said that the Israel Defense Forces would enlist up to three divisions, following the cabinet's approval. "First we will call up commanders, and when the time is right also soldiers," he said. Halutz added that "the Israeli government is backing us and approving our operation, and has accepted the call to recruit reservists. There is no automatic recruitment here. We have no plan to concretely threaten anyone." "The enlistment of reservists is aimed at creating another protection level and enabling the army to prepare for any possibility. This is the duty of the army and the duty of the State to allow it to do so. The move in Lebanon has not ended and will continue as long as it takes," he said. Peretz went on to say that "the goal of the security effort is to create a special security area. We will not accept a situation in which the Hizbullah flag is once again waved over Israel's border." He opened the briefing with a general review: "The State of Israel is now in the 16th day of fighting in the north and in the 33rd day of fighting in the Gaza Strip. Israeli citizens – we are in the midst of war." Peretz referred to the harsh battle in Bint Jbeil: "The battle claimed a heavy price from us. At this hour IDF fighters continue their war in the air, the sea and the land. Commanders and soldiers in the IDF are courageously fighting the enemy while making extraordinary sacrifices, all this in order to hurt the radical terror sources which have accumulated and been built throughout the years on the northern border." "During the 16 days of fighting, in yesterday's operation, we suffered painful losses, but this will not break us down and will not weaken us. We are allowed to feel pain, but not to break down. We are allowed to worry, but not to let go. "Our goal is to create an area clean of terror and Hizbullah strongholds, so that the crisis can end. They will not be able to return to their places. The goal of the offensive effort is to create a special security area. A special security area will create a better protection on the northern border. "We will not accept a situation in which Hizbullah's flag is waved on the State of Israel's fences again. Hizbullah will not return to be what it was. This may take time, this may also require strength. We have both that and that," Peretz added. Peretz also referred to the tension opposite Syria, especially in light of Thursday's publications, according to which Syrian officials claim that the IDF expanded its deployment in the Golan Heights. "There is sensitivity opposite Syria, but the message from us is firm and unequivocal – there is no plan to open a front with Syria, but the Syrians know that we are keeping guard. I hope Hizbullah doesn’t drag Syria into this crisis," he said. Chief of Staff Halutz said that "those who brought about the disaster on Lebanon are their own people, Hizbullah. However, Israel is operating so as not to hurt them and innocent civilians." Halutz also asked to express his appreciation of the civil home front, which is strengthening the entire establishment, of the military establishment, and especially of the soldiers, "who are doing a wonderful and holy job." Halutz also referred to the harsh battle in Bint Jbeil: "We experienced a difficult operational experience, we paid a price, but in the face of this price, which is very dear to us, we have claimed a heavy price from Hizbullah." "Dozens of dead terrorists were left in the field. We are not making comparisons and not measuring the dimension of our success with the number of casualties on the other side," he added. a different instruction or reach the goals which have been set before us: The first relates to creating the conditions for returning the kidnapped soldiers. The second relates to creating a different security reality which will prevent Hizbullah from reaching the fences of the State of Israel. The third relates to weakening Hizbullah, and the fourth relates to applying the authentic Lebanese sovereignty of the Lebanese government on its territory." Following the publications which implied that Hassan Nasrallah may be hiding in Damascus, Halutz said: "I cannot confirm or deny this because I know nothing about Nasrallah's whereabouts at this moment. I did not mention him as one of the operation's targets because the list of assassinations is long." "However, we do not plan to kill each and every Hizbullah member, but rather they should decide to improve themselves and realize that there are worthier ways," he said. See all talkbacks "Peretz: We’re at war, we must win"